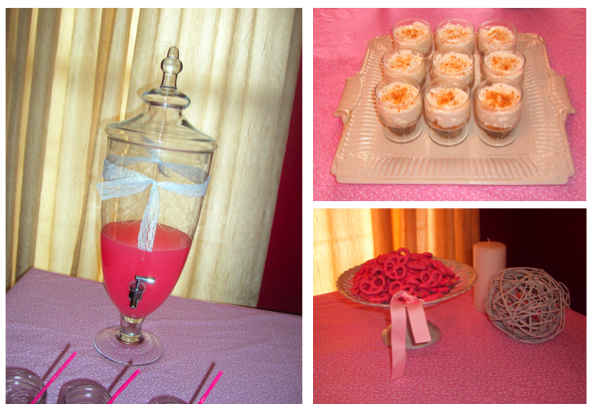 I finally got a chance to get a few of the photos together from the beauty/spa party I did for the MOMS Club I belong to. It was a lot of fun. The decor and the food was–what I like to call–"just right simple." 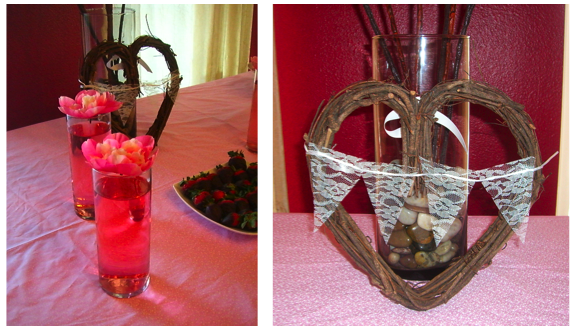 I served chocolate covered strawberries, cheesecake cups (recipe here) and cherry y0gurt covered pretzels. Since it was right before Valentine's Day, I did a soft Valentine's Day theme. Simple enough that I didn't have to knock myself out on a weeknight, but yet still pretty enough that it made the night feel a bit more special. As far as what the night entailed (besides cocktails! ), each woman brought a beauty product for everyone to try: a funky blue nail polish, hand cream, etc. We made a lip gloss that I shared earlier here. But the real special treat was the massage therapist we had to give each of the women a massage. Heaven! It was truly a well-deserved night for the moms. It looks like a beautiful project and beautiful party! I hope you guys had a lot of fun.